1. Lightly grease or cover with parchment paper a large baking sheet. 2. Pour warm milk into a large mixing bowl. Sprinkle yeast and 1 Tbs of sugar over the milk. After yeast has dissolved and started to ferment, add the rest of the sugar, butter, eggs, liquid flavorings and salt. 4. Stir in 2 cups of flour to make a thick batter; beat 200 strokes with a wooden spoon or heavy-duty rubber spatula until dough is quite smooth. Gradually add remaining flour– 1/2 cup at a time and beat in until blended. When dough is too stiff to stir, use a plastic or metal dough scraper to integrate sprinkles of flour until dough is stiff enough to turn out on lightly-floured surface for kneading. Keep adding minimal sprinkles of flour until dough is smooth and elastic. 5. Grease bread bowl with vegetable oil or butter. Drop dough into bowl and swirl and turn around until dough seems covered with oil. Cover with lightly oiled plastic wrap and/or tea towel and let rise, in a warm place, for about 1.5 hours or until doubled in bulk. 6. Punch the dough down and turn onto a lightly floured surface. Knead gently for 2 or 3 minutes. 7. Shape dough into a cylinder and gently roll across the top of the counter with the palms of both hands of form a long rope, 26 to 32 inches in length. Place rope of dough in a large ring on the parchment-lined (or greased) baking sheet. 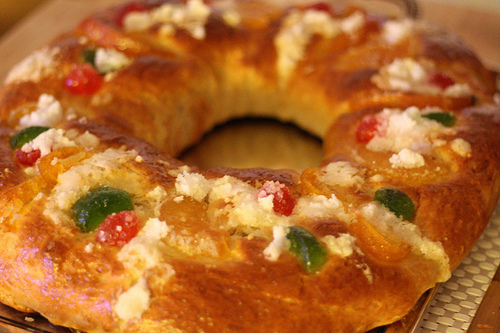 Squeeze the two ends of the rope together and seal–shaping the rosca into a “seamless” crown. 8. Cover with oiled plastic wrap and let rise in a warm place for 1.5 hours or until doubled in size. 9. When the rosca has risen, preheat the oven to 350o F. Brush the roscon with the egg white and decorate with candied fruit as though placing jewels in a crown (you may need to use a sharp knife to cut into the “skin” of the dough and then push the “jewels” slightly into the dough). Brush the whole roscon again with egg white and then sprinkle on the almond flakes. 10. Bake for 30 to 35 minutes or until risen and golden. (A meat thermometer inserted a bit more than halfway into the loaf should register 190o and come out perfectly clean). [Hide trinket, coin or dried bean in the loaf–serve with paper crown on top. Whoever gets the secret surprise wears the crown as sovereign of the day].